Symbols*: The polar bear plunges into the icy green depths of the sea. It swims joyfully toward three cups standing steadily on a rock ledge. The cups are containers of creative energy. 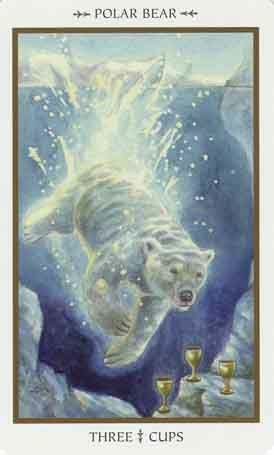 The polar bear, with its remakable agility in the water, observes the cups and anticipates receiving the gifts of fertility, success, and abundance. The polar bear symbolizes the protective mother and the ability to adapt and survive under the harshest conditions. The bear leaves a trail of bubbles that rise to the surface and break through the barriers to conscious thought. The energetic movements signify posperity and overflowing emotions. Description*: If your heart is surging with good energy, apply that positivism through creative means. Starte a new project or acknolwedge your initial triumphs by doing something special for yourself or by celebrating with friends. It is a time to share these feelings with those that you care about and to motivate people with your optimism. By nurturing others you will enhance your own good feelings, thus allowing your joy to circulate back to you. Possible Meaning: You may be overflowing with happiness, and feeling celebratory. Are you conserving your strength and energy and/or putting it to good use? Polar Bear Spirit teaches this balance for survival as you are guided to walk in light and truth at this time. He will teach how to walk on the "ice" of life with grace and a lightness. Thoughts/Points to Ponder: This Polar Bear is not any polar bear, he is very special. He is kind, loving, big hearted. He is a bit older as well, he is very wise. He always has an answer to every situation and what you can do. He is helpful when you are in the middle of transformation. He is looking at me with a huge smile on his face, I cannot help but to smile back. Polar Bear deals with death, birth and transformation of a mystical quality, teaches strength in adversity and endurance in situations, ability for sustenance and endurance through introspection and solitude, can show how to tap into emotions with clarity. Polar Bear teaches how to be aggressive and forthright to achieve your dreams and empower your thoughts and ideals. He demonstrates the power of observation and movement with perfect timing.